Tax records from 1253 record that this church was then dedicated to St Collen, after whom nearby Llangollen is named. The church tower probably dates from the 14th century. Inside the church are two stone effigies from this period. Some of the stonework, for example parts of the north aisle, may date from the 13th century. 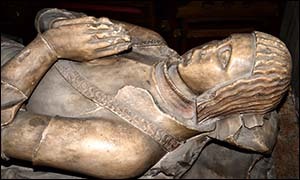 The church also contains a large effigy of John ap Elis Eyton (d.1526) and his wife Elizabeth (d.1524). He received land in the Ruabon area and an annuity of 10 marks from King Henry VII after his support at the Battle of Bosworth in 1485, where Henry Tudor defeated King Richard III to establish the Tudor dynasty. Earlier in the Wars of the Roses, Jasper Tudor (Henry’s uncle) wrote to John Eyton and Roger Puleston at Denbigh Castle in 1461, describing them as trusty and loved and seeking their support to avenge the recent beheading of his father, Owain, by Yorkists. The church was later linked to the Wynnstay family and contains many memorials to members of the family. They include a monument to Lady Henrietta by the great sculptor Joseph Nollekens. The font was designed by Robert Adam to mark the baptism of Watkin Williams Wynn in 1772. The chandeliers also date from the 18th century. In 1870, when the church was being restored, a 15th-century wall painting was revealed. Its theme is the Works of Mercy, and five good deeds are illustrated. Other features include two old parish chests, one of which contains copies of the parish registers dating back to 1559. The stained glass shows events in Jesus’ life and is dominated by the work of Ward and Hughes of London. Four of the six bells date from the 18th century. The present church owes much to the Victorian restoration. This brought in the pews, the present communion rails and the Gothic reredos. The church’s lychgate was erected in 1920 as the parish war memorial. It now also commemorates the local Second World War dead. Since 1980 the Anglicans have shared the church with Roman Catholics, whose own church in the parish had needed major repairs. Both congregations sometimes worship together, alongside local Methodists.